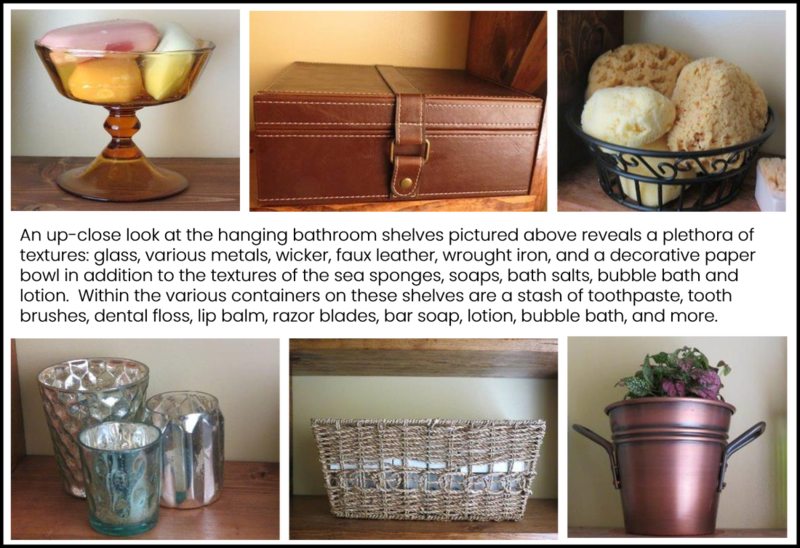 Bathroom storage is like chocolate – you can never have too much of it. Given the nature of the bathroom’s function, namely grooming, it must provide storage for numerous tools and toiletries. The more people who use the bathroom, the more stuff there is to store. The trouble is, storage space can be hard to come by. The average size of a full bath in the United States is less than 50 square feet. Take away the space occupied by the fixtures (tub, toilet, shower/bathtub) and you’re not left with much in the way of bathroom storage space. Newer homes trend toward more spacious, spa-like bathrooms, but many of us (perhaps even the majority) are faced with tight spaces and inadequate storage. Of the 18 homes I’ve lived in as an adult, I can count on one hand the number of them that had a bathroom with cupboards or drawers. Most had pedestal sinks and a medicine cabinet (and that was it). Until recently we were living in the Middle East in a lovely, spacious villa with five full bathrooms and a half bath. With all those bathrooms, you might assume that we had tons of storage space at our disposal, but not one of them had an ounce of built-in storage (not even a medicine cabinet). As renters, remodeling is obviously not an option. 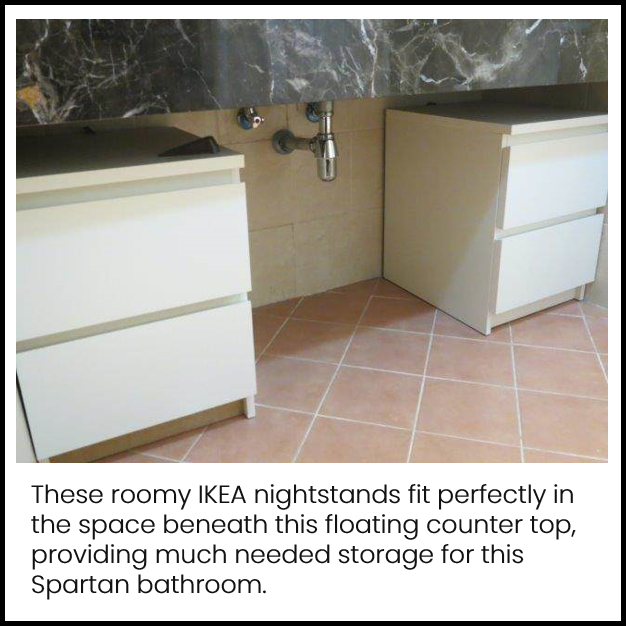 So what can be done to increase the bathroom’s storage capacity? Quite a bit, actually. 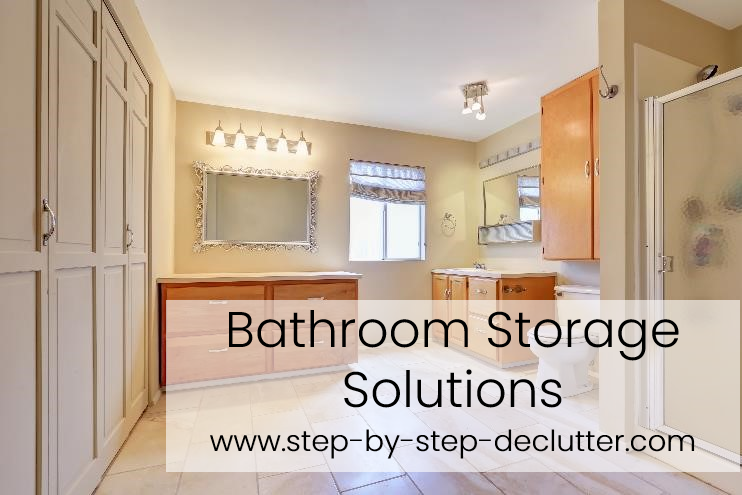 I will focus here on simple, changeable bathroom storage solutions that will increase your bathroom’s storage potential without significantly impacting your budget or requiring construction. Look around your bathroom in search of unused space. Are there any nooks, crannies, alcoves, recesses or niches with untapped storage potential? Most toiletries and other bathroom accessories are narrow in nature. A space doesn’t have to be deep to be useful for storage. Here are some suggestions for ways to reclaim open spaces in your bathroom for storage. Fill an alcove with built-in shelves. Find a commercial over-the-toilet storage unit or create your own. Add a skirt around the base of a pedestal sink to hide necessities out-of-site yet close at hand. Search for the perfect furniture piece to fill an empty alcove or recess in the bathroom. Dressers are a nice option if you've got the space. Other options include bookcases, hutches, armoires, storage cabinets, reclaimed wall lockers, rolling carts or étagères (open shelving units). 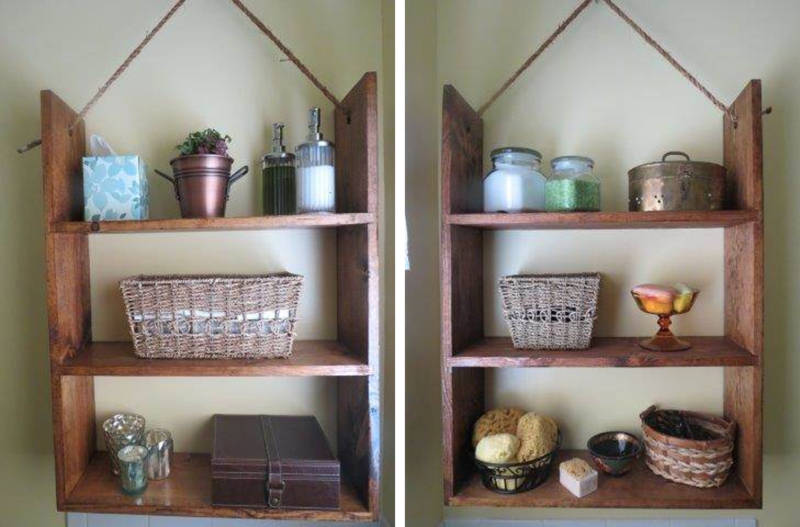 Wall shelves are an inexpensive and versatile way to add bathroom storage. You can buy ready-made shelves or build your own. You can find shelves in a variety of materials and styles to coordinate with your décor. Cubbies or cubes hung on the wall are both fun and functional as storage. Baskets, bins or decorative metal buckets can be hung from towel rods using S hooks to create a unique and attractive storage solution. Speaking of hooks, they’re not just for towels and bathrobes. Hang a stylish basket, bin, bucket or even a sturdy canvas bag from a decorative hook for a simple storage solution. Use small cardboard boxes (like the kind jewelry comes in), egg cartons, ice cube trays, muffin tins, desk organizers, small plastic bins, or other organizers to keep the contents of drawers orderly. 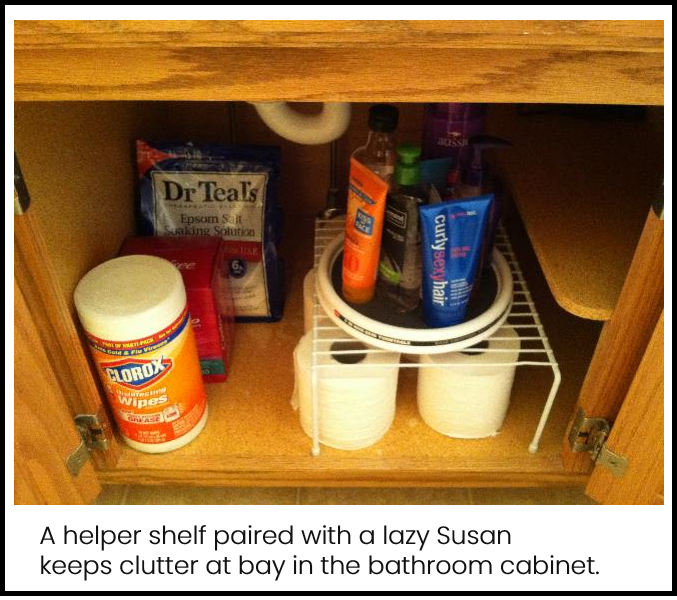 Use a lazy Susan to store various skin and hair care products. It keeps everything within easy reach so you don’t have to move six things to get to the one thing you’re looking for. Use helper shelves and other cupboard organizers to allow you to stack items within the cabinet while still maintaining easy access to everything. Ideally you want your bathroom to be both functional and beautiful. It can be challenging to achieve this goal in a clutter-prone environment. Try implementing these tips to create attractive bathroom storage solutions. Whenever possible store all the awkwardly shaped, oversized, and unsightly items out of sight in a cupboard or drawer. Save the exposed storage for the pretty stuff (decorative soaps, sea sponges, bath salts, plush towels, etc.). Choose storage containers that are attractive. Look for pretty baskets and bins to store your bathroom gear and transform it from mundane to marvelous. Whenever possible choose opaque containers so that the container is what’s visible and not the contents unless, of course, the contents are pretty. Corral loose stuff. Nothing says clutter like a jumble of mismatched bottles of hair and skin care products scattered across the bathroom counter. Contain them in open baskets or bins. Group items according to type. Have a basket for hair care, one for skin care, one for nail care, and so forth. Introduce a variety of textures in the form of storage. Bathrooms are by nature sort of cold and hard – lots of tile, porcelain, metal, and glass. Warm up the space by adding texture in the form of wicker baskets or shelving units, wooden boxes or shelves, fabrics (curtains, towels, bath mats, shower curtains, canvas bins), metal bins or boxes, and so on. 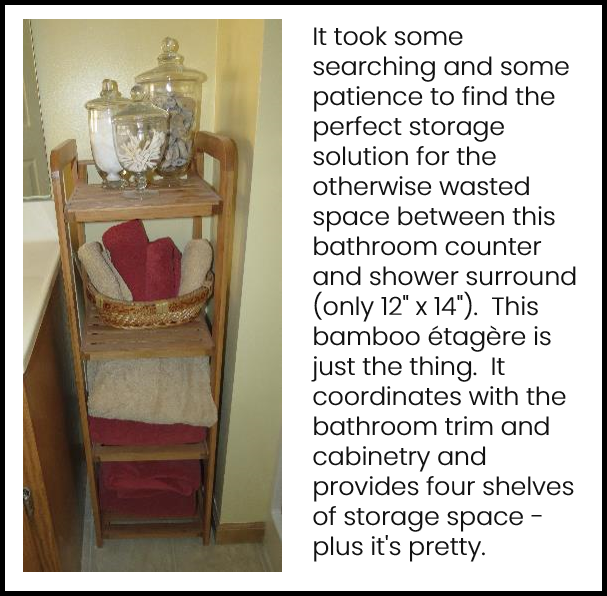 Whatever your bathroom storage challenges may be, I hope these bathroom storage solutions will be helpful. If you know someone who would benefit from these tips, please share this page on social media. Then leave me a comment in the section below so I can thank you personally.